Like many 10-year-old girls, Maeve Jones, from Reading, Massachusetts, belongs to a dance school—tap dance to be exact. When she decided she wanted to perform in her summer dance recital, though, she decided to turn to someone in her family (who happened to be more than 60 years her senior) to be her dance partner. That someone happened to be her 72-year-old grandpa, Bill Jones. And Bill was more than happy to accept his granddaughter’s request. “My mom says my grandfather loves to dance, and I asked him if he wanted to do a tap duel with me, and we did it. And it’s amazing,” Maeve told WHDH. This little lady is stage ready! 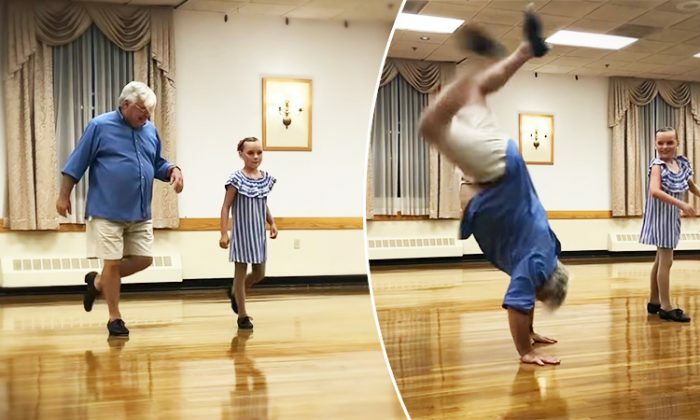 Although Bill is 72 years of age, dancing runs in the family—both his mother and father were dancers, and his grandmother was a professional dancer—and Bill, too, had some experience. Of course, he also didn’t want to disappoint family members who were thrilled by the prospect of the dancing duo. The crowd, of course, cheered at the tap duo, who perhaps surprised them with Bill’s nimble feet. But what got everyone riled up was when Bill managed to pull a cartwheel in sync with Maeve for the finale. And with that, he planted a kiss on her forehead and the two walked offstage. Maeve’s mother, who, originally, recorded the show in order to share it with friends and relatives, shared the video online—where the duo garnered far more attention than just that, as it was shared almost 190,000 times. “I hope we can dance again sometime,” Bill added.